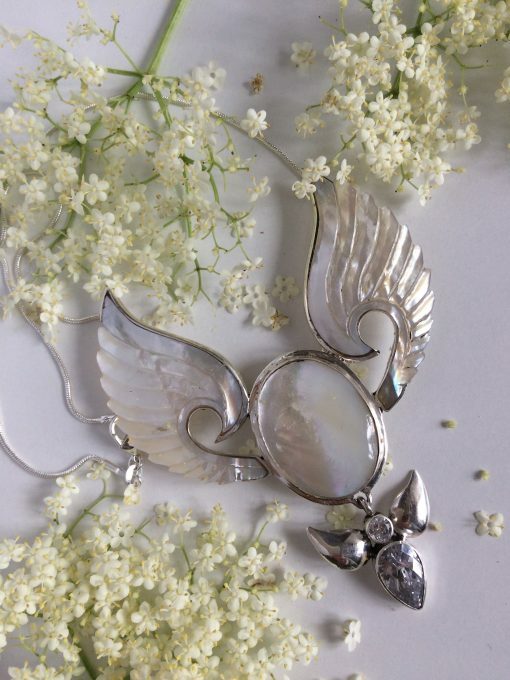 Overflowing with Divine Feminine Life Force, the hand carved Angel of the Divine Feminine, in sterling silver, with Mother of Pearl Wings and Crystal Angel drop, beautifully sustains the essence of giving and receiving Compassion, & Nurturing Love. Divine Feminine Angel Necklace is the epitome of femininity. 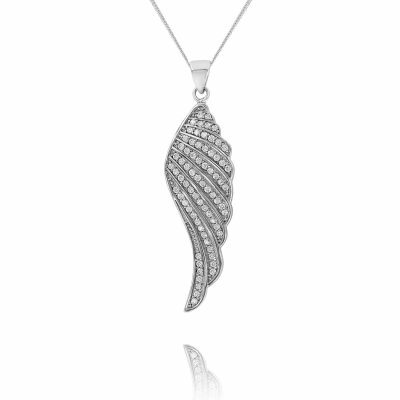 As women, we are easily able to give of ourselves, but forget that our soul’s purpose is to enter into the 2 way flow of love and this means remembering to receive as well as to give. 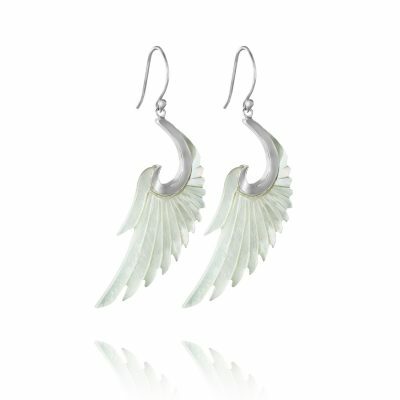 “Give yourself permission to be gorgeous, fabulous, we are all meant to shine” – Marianne Williamson. Just as the ocean’s wave’s ebb and flow, so the heart also needs to give and receive. The Divine Feminine helps us to remove all barriers and obstructions which stand in the way of love’s natural ebb and flow. Then, as we experience the joy of receiving, we are better able to give, because now we give from a place of fullness, unconditionally and motive free. 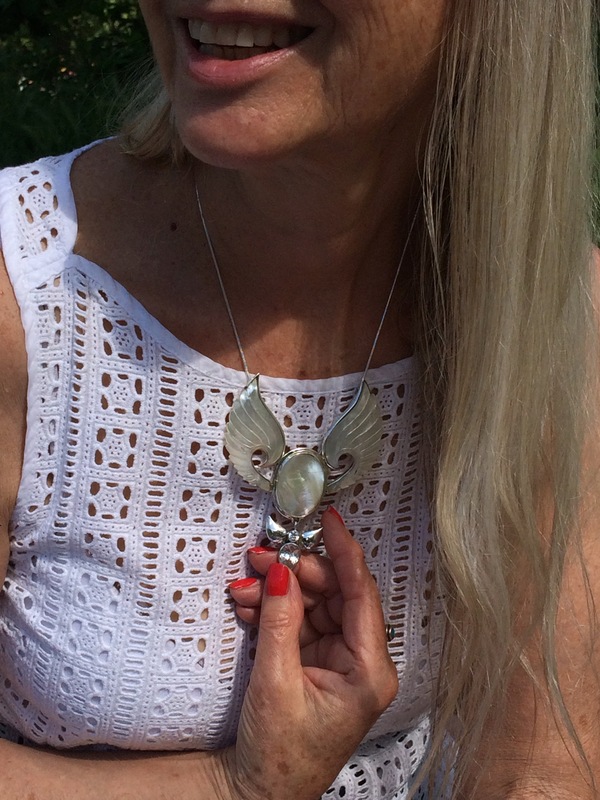 This is Divine Feminie Love, it is the way love makes us feel beautiful, boundless and fabulous in our femininity. 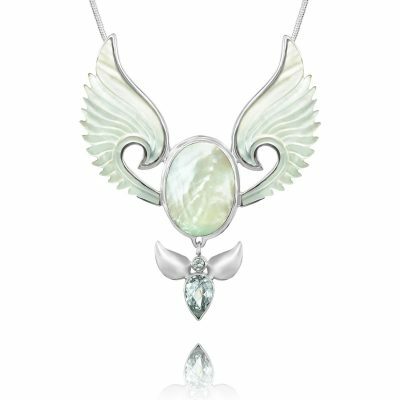 The lovely hand carved Mother of Pearl Wings of the Divine Feminine Angel Necklace are set in silver with a baby Angel drop. 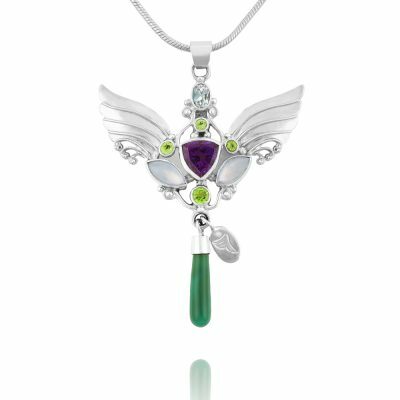 We post the Divine Feminine Angel Necklace worldwide, using a fast and safe, tracked service. 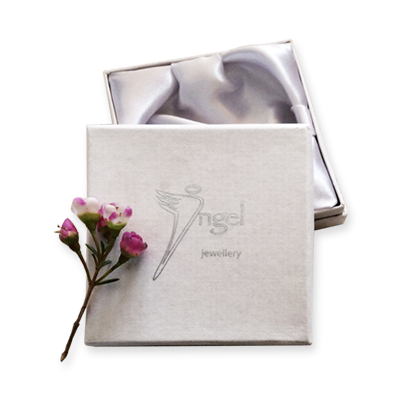 Pendant comes with chain and is beautifully presented in a satin lined box with short printout describing the Angel. You might like to read more about the divine feminine here. 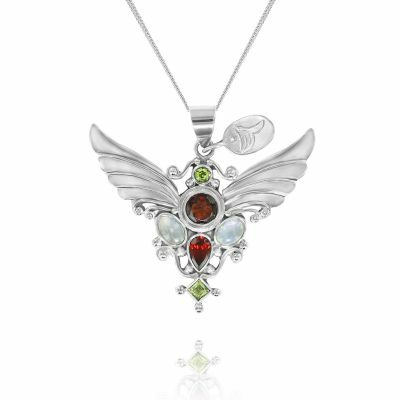 Extremely high-quality expensive looking product. Stunning necklace, even better than the photo, it looks beautiful thank you! Thank you for your kind comment Barbara. 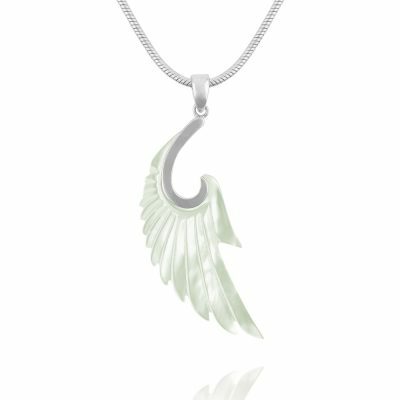 I love this Angel Necklace, its one of my favourites too. x Linda.